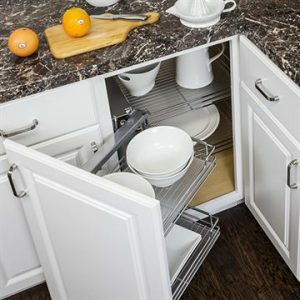 Update your kitchen cabinets and take them from cluttered to beautifully organized with versatile Cabinet Organizers. Van Dyke’s Restorers is proud to now offer over 550 cabinet, pantry, drawer, and closet organization solutions. Life is much easier when you have quick and easy access to cooking utensils, pots and pans, food, and other household items! Installing Cabinet Organizers is one of the most popular kitchen renovation projects. Organizers include lazy susans, pull out wire baskets, pantry organizers, drawer solutions, wine racks, stemware racks, waste containers, and closet organizers. This blog will highlight some of the features and types of Lazy Susans. 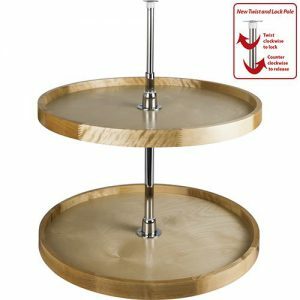 A Lazy Susan is a rack of shelves that rotate on a pole to easily access food items and other household items. 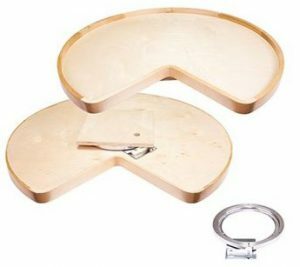 Lazy Susans include the tried and true round and kidney-shaped options in plastic, wood, and metal. They generally have two or three shelves that rotate independently. They can be used in corner cabinets or straight cabinets. Lazy Susans are also a popular feature in the center of a dining or serving table. These rotating shelves are offered in several sizes including 24”, 28” and 32” models to fit any cabinet space. They are ideal for use in a corner cabinet where access is often limited and reaching in the back of the cabinet is difficult. The New Easy 360 Susan cabinet organizer is the latest corner solution that transforms a corner cabinet from cumbersome to versatile usable space by combining the convenience of a drawer with the benefits of a Lazy Susan. The Easy 360 is also easy to install with no drilling required. The unit mounts directly to the bottom of the cabinet with a few screws. Optional top mounting can be done for extra stability. 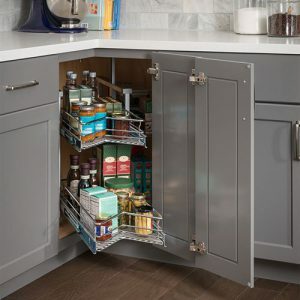 This collection of cabinet organizers also has solutions for storing pots, pans, and lids and numerous pantry options, as well as sliding drawer trash containers, closet organization solutions, and more. I will highlight many of these organizing solutions in future blog posts. Follow this link to see all the new organizers and starting getting organized.